Rahul Dravid raises his bat to celebrate his century on the first day of their second test cricket match against West Indies in Kolkata 14 November, 2011. Reuters. 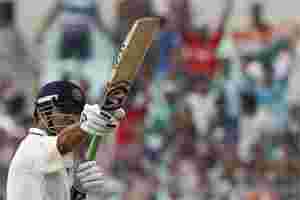 Kolkata: Rahul Dravid on Monday reached a commendable milestone of becoming the highest run-scorer in 2011 surpassing England’s Ian Bell. Dravid now has 952 runs in 10 Tests in the current year surpassing Bell’s 950 runs from eight matches. ‘The Wall´ has scored five centuries in the current year with two against West Indies and three against England apart from two half centuries at an average of 59.50. It has taken him 19 innings to score the runs while Bell has scored his runs at a staggering average of 118.75 in only 11 innings. Apart from Dravid, VVS Laxman also reached a mini milestone on the day when he completed 1500 Test runs against the West Indies. •119 vs West Indies at Eden Gardens.